With the fine weather and some holiday days to take before the end of June, it seemed like an ideal opportunity to spend some time up the hills. Also - after a warm-up on Beinn Chabhair a few weeks back, I felt that my hill legs were firmly attached. 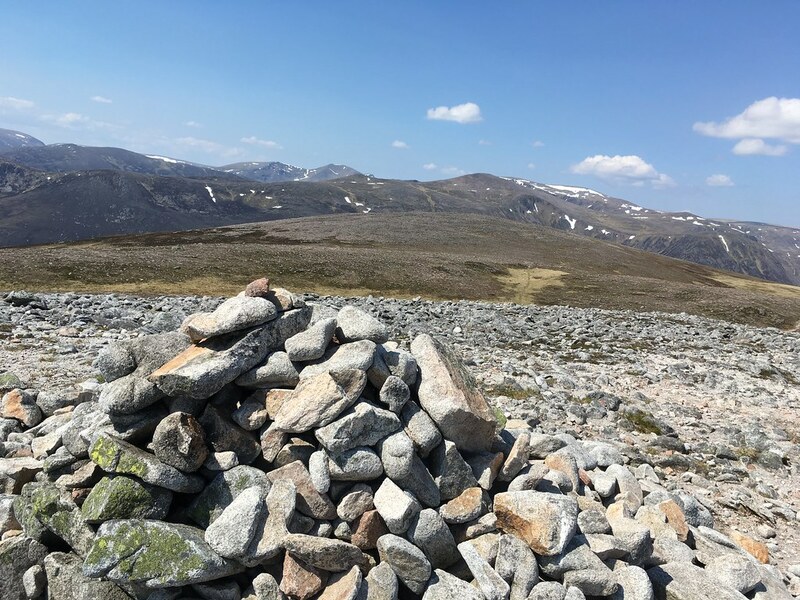 This week, I came to the realisation that it has been a looong time since I spent any time in the Cairngorms, and while pondering the map, I started hatching a plan for a two day walk. After fuelling up on a lunchtime burger in Braemar, I set off for Derry Lodge by bicycle in strong sunshine. I ditched the bike behind the lodge, then set off by foot - although I deliberately packed light - I'm certainly not used to carrying a full overnight pack, so I was taking it easy - I knew it was going to be a hard slog today. 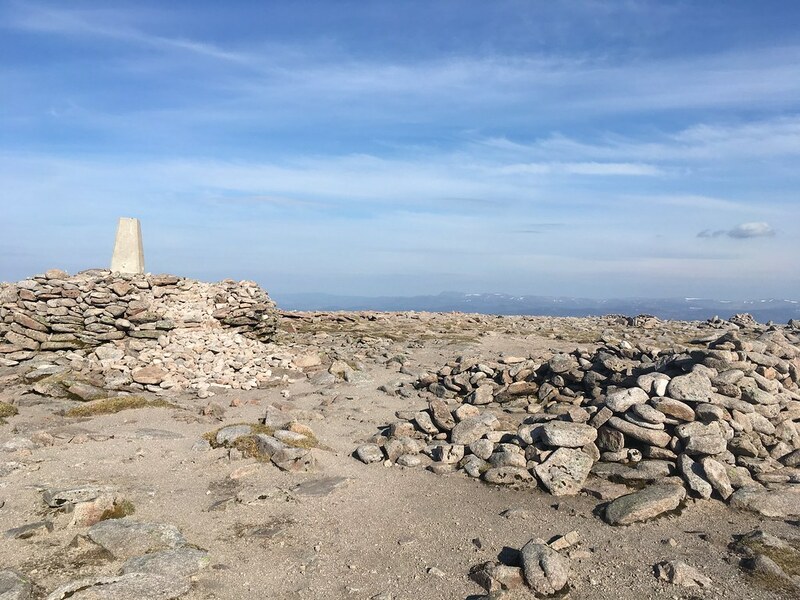 The first objective came surprisingly easily - Carn a'Mhaim - the view out to the eastern Cairngorm and across the Larig Ghru were spectacular. Following the ridge further north, the path follows an arete that drops down 200m or so, while Ben MacDui looms ever-larger, with about 450m of ascent to reach the summit plateau. The weight of the rucksack was starting to take its' toll, so taking a rest at the foot of the climb, and found some snacks to keep me going. It was at this point that my water ran out. 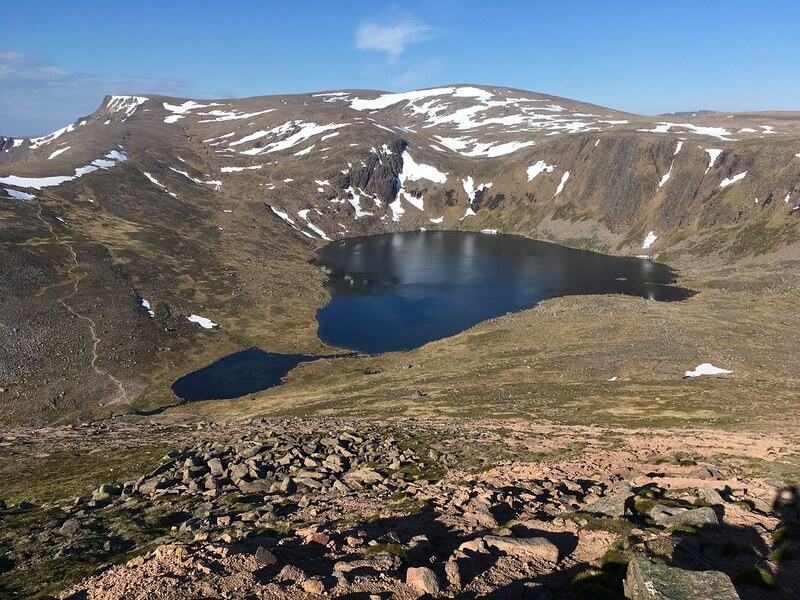 That was the plan though - I had deliberately only taken a litre of water in my platypus to save weight - the map shows a gully with the Allt Clach nan Taillear close to where I was ascending. The plan was to refill from there. What could possibly go wrong? At the point that my route intersected the gully, I found that it was completely full of snow. I could hear the water flowing somewhere, but there was not much chance of me getting at it. 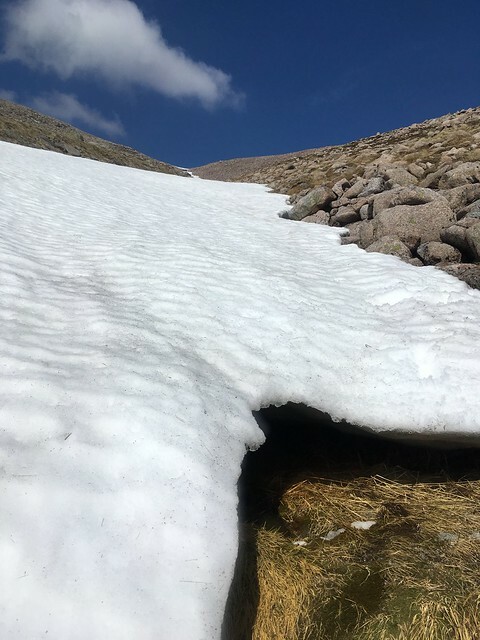 The ascent up the side of MacDui is a boulder field, and I could see that it starts to get particularly steep futher up on the route that I was on - but I had no particular choice, but to follow the snowline, and hope/expect that at some point the water would put in an appearance. It did, nearly at the top, by which it was a relief to be able to take a long drink of cold, cold water. 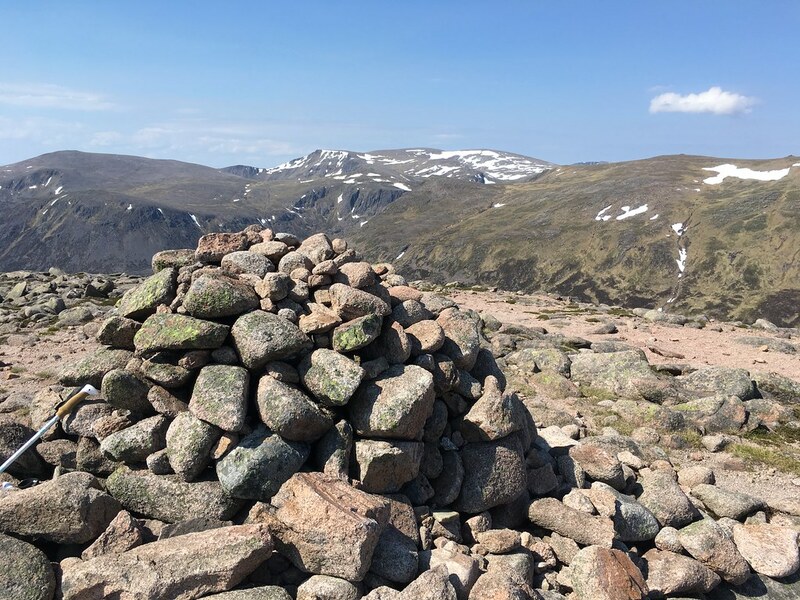 Pressing on, I summited Ben MacDui at about 6pm, spending some time chatting to a foreign tourist who appeared to be navigating by Post-It notes - he was doing big distances though - and heading out to Braemar to stock up with food. The wind had risen quite substantially, and I was tiring rapidly. 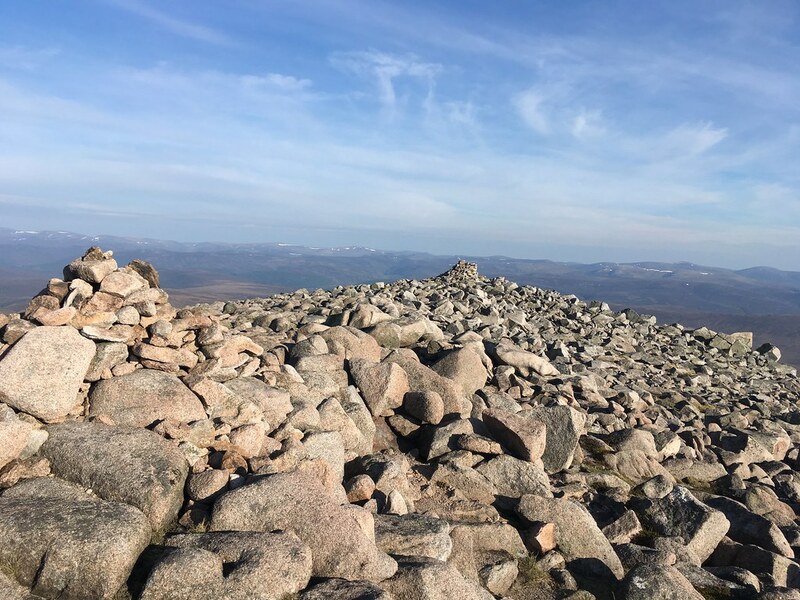 Navigating the boulder field on top of Derry Cairngorm was putting a strain on my sense of humour, and although taking it slowly, I still nearly fell a few times before reaching the summit at just after 7pm (still wearing t-shirt and shorts!). I didn't hang about at all.. straight back to where I left my bag, and on to Loch Etchachan to set camp for the evening and get some rest. And what a location - beautiful..
From Loch Etchachan, it's a simple up and down to the first hill of the day - Beinn Mheadhoin. It reminded me a lot of the film "Up! ", with it's peculiar tors on the summit. Descending past the Hutchison Memorial Hut, I was in two minds whether to continue on with my intended route, or to head straight down Glen Derry and back to the bicycle. Once I got to the footbridge, it was decision time - I stopped to refill water and think it through whilst checking the map. I came to the conclusion that I should press on - I would most probably regret bailing out now, and I felt that I had enough time to have a good rest, should I need it. The ascent up the side of Beinn a'Chaorainn was horrible - mostly wheezing and heather-bashing - which annoyed the hell out of the poor Ptarmigan that were trying to enjoy their Saturday morning. The walk from Beinn a'Chaorainn to Beinn Bhreac was a bit of a shock to the system, after the well maintained paths of the other hills I was on this weekend - however - after a bit of a trudge, Beinn Bhreac came and went soon enough. Now I find myself back home, looking at the map, and wondering - where next?